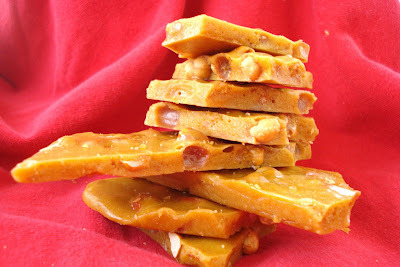 This is a repost of my famous Peanut Brittle. I love this stuff! I haven't had the time to make any this year, but i'm hoping I can atleast get one batch done before the season is over. Either that or i'll whip up a batch in the spring time. How random would that be?! Have a great Tuesday!! Yes...it's just me, Erica, today. Let's just say Moni had a little mis-hap with hers with smoke and sparks involved...lol...and she will be posting tomorrow. I decided to make my Peanut Brittle. I've been making this for a few years now. It's so deliciously yummy and it seriously melts in your mouth. It's just a few simple ingredients, but you need to have patience in making it. The results, I promise, are worth it! I hope my neighbors were happy with my treat this year. I will be making more for my family, cause it's so good, it needs to be shared. In a big saucepan combine sugar, corn syrup, and water. Cook over low heat, stirring occasionally, until sugar is dissolved and mixture comes to a full boil. Add butter; continue cooking, stirring occasionally, until candy thermometer reaches 280 degrees or small amount of mix dropped into ice water forms a pliable strand, 80-90 minutes. Stir in peanuts; continue cooking, stirring constantly, until candy thermometer reaches 305 degrees or small amount dropped in ice water forms a brittle strand. Remove from heat and sitr in baking soda. Pour mixture onto a big buttered cookie sheet or two small cookie sheets. Spread and let cool. Break it up by hitting it with a knife or something hard. This stuff is so hot, so keep your kids away. Hope you enjoy it as much as we do! Stay tuned for Moni's part tomorrow...I hope! Oh, I can't wait to eat this. MMMMMMMMM! This neighbor hasn't gotten her peanut brittle. But I will patiently wait by the door for your special delivery... Love you!